A 3 bedroom end of terrace house with garage and a 20‘ x 18‘ rear garden in need of complete modernisation throughout situated in a cul-de-sac just to the south of the town centre. Some of the neighbouring properties have had loft conversions to create substantial master bedrooms. The accommodation comprises: an entrance hall, a good size kitchen and a separate lounge with doors to the garden at the rear. 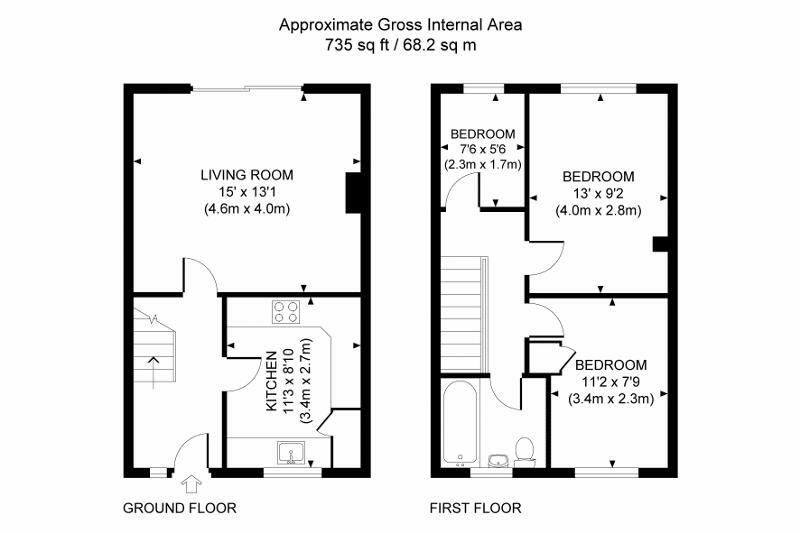 On the first floor there are two double sized bedrooms, a third single sized bedroom and a bathroom. Outside: there is a small front garden mainly laid to lawn which could be sacrificed to create additional off-road parking if required and there is an enclosed rear garden which is laid to lawn with a garage behind. The property is offered for sale with no onward chain. St Edmunds Road is an established residential area located off Petlands Road just to the south of the main town centre. A twitten runs close by towards the end of the cul-de-sac which provides a useful cut through to Wivelsfield Road and the Sainsbury's local store. The Princess Royal Hospital is within a short walk and the main town centre is 0.3 miles distant providing an extensive range of shops, stores, cafes, restaurants and bars. The town also has numerous sports clubs, leisure groups and a leisure centre. Schools are well represented and there are several primary schools within walking distance of the property. A regular bus service runs along Wivelsfield Road linking with the railway station, the neighbouring districts and Brighton. The railway station is 1.2 miles distant and provides excellent commuter services to London, Gatwick and Brighton. By road, access to the major surrounding areas can be gained via the A272, the B2112 and the A/M23, the latter lying about 5.5 miles to the west at Bolney or Warninglid. Haywards Heath mainline railway station (1.2 miles) provides a fast commuter services to London (Victoria/London Bridge 47 mins), Gatwick (15 mins) and the south coast (Brighton 20 mins).